Usability testing provides evidence-based insights into product performance that contribute to market acceptance and commercial success. Successful product design, development or acquisition starts with understanding user needs, and then evaluating how well these needs are met in each component of a system. A product, whether a prototype or off-the-shelf, must be shown to fit the people who are to use or operate it within the context of its use. The knowledge, skills and aptitudes of intended users, supported by sufficient training, must fit the product. A usability assessment process appropriately scaled to the stage of development provides systematic evaluation of the feedback and performance of representative users performing representative tasks after representative training to speed successful development, help catch sources of human error, enhance user acceptance, performance and safety, and contribute to quicker market acceptance. Whether developing a new product or selecting a single off-the-shelf product from among many possible products, the choices made must also fit well within a pre-existing system. Choice and design of features must be evidence-based and the product chosen or developed must be compatible with all the other functional components in the system. The most complex and important component of all is the user or operator of the technologies in question. To be effective, usability testing must address several challenges. Professional independent usability testing provides objectivity and traceable evidence during the design or acquisition cycle to improve the human system integration of the product created or acquired. 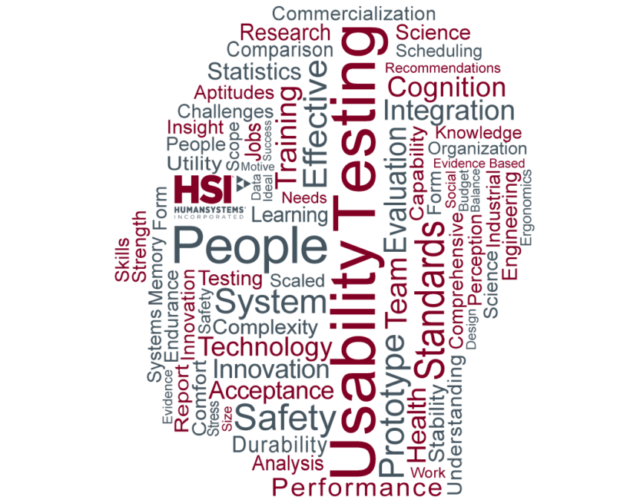 By offering comprehensive and cost-effective usability testing during prototype development or product acquisition, HumanSystems® (HSI®) provides systematic identification and evaluation of how well critical user needs are met before the product goes to market or is selected for large-scale purchase. Critical human factors contributing to individual, team and system performance and well-being can be isolated and addressed to benefit innovation, commercialization of great ideas, system safety, and market acceptance. HSI® provides each client with a customized Usability Test Plan to deliver an expert, comprehensive usability evaluation for product development or acquisition. This plan manages the scope and scheduling of the evaluation process to make best use of the available budget, time and other resources. HSI® can provide progressively scaled testing, from simple mock-up or other simulation through bench-top prototype and ultimately to field testing. The level of evaluation conducted is governed by the risk acceptable to the client, the developer, users, and the system as a whole. HSI®’s goal is to support objective evidence-based usability decision-making starting early in the process and then working throughout development or acquisition to help isolate and address usability, learnability, compatibility and utility. Expert Review: Examination of the scientific literature and case studies to inform decision-making. Desktop Analysis: Assess plans, drawings, simulations, function flow charts. Conduct focus groups and interviews. Laboratory Evaluation. Assess product or prototype performance under standardised conditions. Field Trials. Testing in real-life conditions.